Griffon possesses a deafening roar to stun its opponents. Its hands have sharp claws that never dull. It has powerful wings that give the ability to fly the highest in the air. It has a serpent tail that possesses a venomous bite, which can easily defeat an enemy brawler. Griffin is not very powerful. 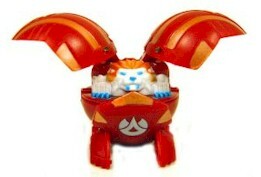 But is a good bakugan if you just wanted some reinforcement. Purchase Griffon from Amazon now!